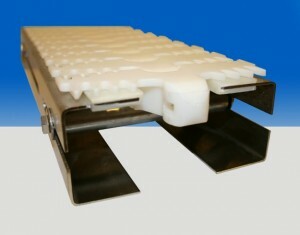 LVP Conveyor Systems Ltd. are the Irish Distributor for the Carryline Slat Conveyors product range. LVP Conveyor Systems Ltd. utilise the Carryline Conveyor systems to provide complete integrated and PLC controlled systems, which can be stand alone or incorporated into existing or new production/packaging areas. 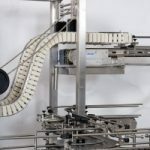 A Slat Chain Conveyor from Carryline is an automated, highly flexible and space efficient conveyor system for almost any type of product movement in hundreds of possible sectors. Carryline’s standard system is in aluminum or stainless steel which consists of a few basic components with a range of different variations to suit any need for material handling. The units are assembled with easily which makes installation and any reconfiguration to the production line quick and cost effective. Carryline S240 is the narrowest conveyor within this range. 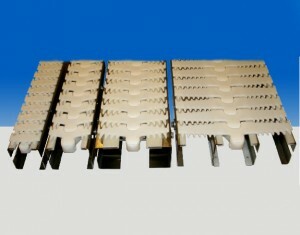 Typical application is used as a twin chain conveyor, with a product such as small platten supported between the 2 chains. The chain is solely for straight-line use. All of Carryline conveyors are rated at under 70 dB(A). Maximum loadings allowed are based on application and line design. Carryline S380 (38mm) is perfect for the handling of small, light goods. The unique design of the chain provides a solid base without gaps between links even when installed around curves. 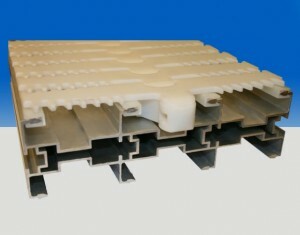 All Carryline conveyors are under 70 dB(A). 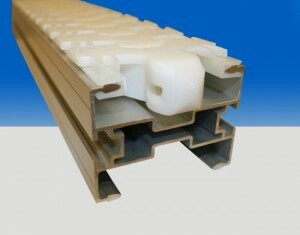 The product loading (kg/m) is dependant upon each application and line design. 62mm Wide. 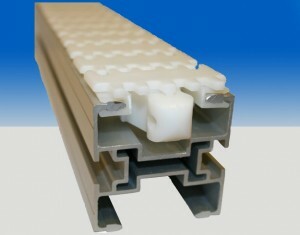 This range starts the point where medium sized products can be handles without compromise to the stability. Carryline S620 is an excellent and quiet conveyor. All of Carryline conveyors are under 70 dB(A). Product loading (kg/m) is dependant upon application and layout. 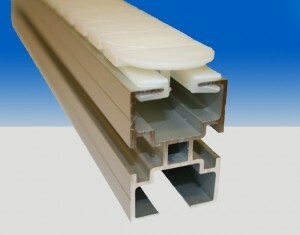 S830-2-300x23583mm Wide. Keeping with the smaller chain widths in the Carryline family, the Carryline is a highly adaptable product, and can handle products with varying widths. The chain can be supplied with many different options, from standard plain top, to friction top to all applications . 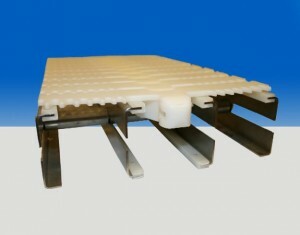 All Carryline conveyors are under 70 dB(A). 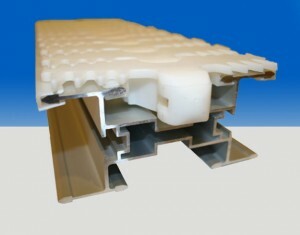 Product loading (kg/m) is dependant upon application and layout. S140-2-300x235140mm wide. Carryline S140 is ideal for medium to heavy duty sized loads, with a range of chain types to suit all applications. S220-2-300x235220mm wide. Carryline S220 is ideal for large and heavy goods, providing excellent performance along great flexible. Certain segments of trade and industry impose stringent hygiene and cleanliness requirements. 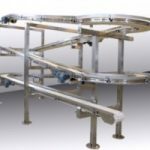 Carryline’s stainless steel conveyor systems are easy to keep clean. 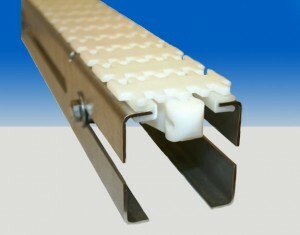 To allow dirt and rinse water to run off, the conveyor beam has a drainage channel. Naturally enough, all the screws, nuts, shafts and pins in the chain are stainless steel. 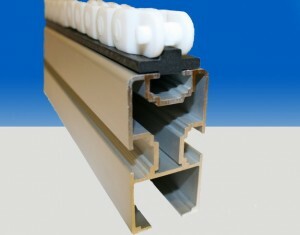 Carryline’s stainless steel systems are welded together at the joins but, to retain the ability to rebuild without welding, can also be assembled using stainless steel connecting strip. The dairy, bakery, medical product, glass manufacture and engineering segments are amongst those to which Carryline delivers stainless steel systems. 62mm wide. Like the Aluminium version, the pitch is smaller and a very quiet chain. Carryline S520 is excellent in environments with stringent hygiene requirements. 83mm Wide. Carryline S530 increases the product sizes that can be handled on this system. Ideal for those applications with hygiene issues. 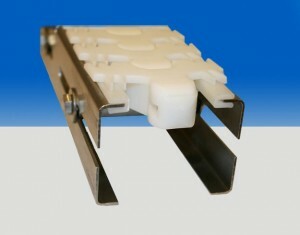 All Carryline conveyors are under 70 dB(A). Product loading (kg/m) is dependent upon application and layout. 140mm Wide. Carryline S540 is ideal for handling larger products requiring more stability whilst being conveyed. Suitable for hygiene applications. 220mm Wide. Carryline S560 is designed for wider and heavier loads, whilst still providing flexibility. Ideal for hygienic applications. Vertical conveying of products is very useful where production takes place on several floor levels or where rapid elevation is essential for a smooth production flow. Carryline offers various types of vertical conveyor systems. A few examples are given below. 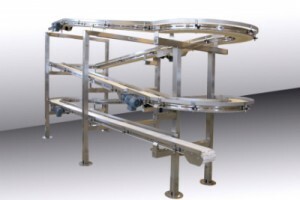 Side-grip conveyors are a variant in which products are gripped from the side and can be run up or down, for example, a 90° slope. One of the advantages of this type of conveyor is that the production flow is maintained without stops or other transitions. 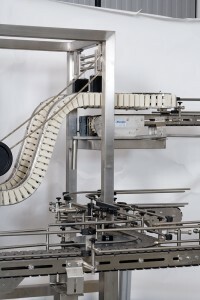 Vertical conveyors can be compared to lifts/elevators in which products are stepped upwards or downwards. One of the advantages of this solution is that it can also be used to buffer products. Vertical conveyors with a top brush are good, inexpensive solutions where light products have to be moved up or down a steep slope. Pushed (by a brush) against a friction chain, the products follow the required slope.